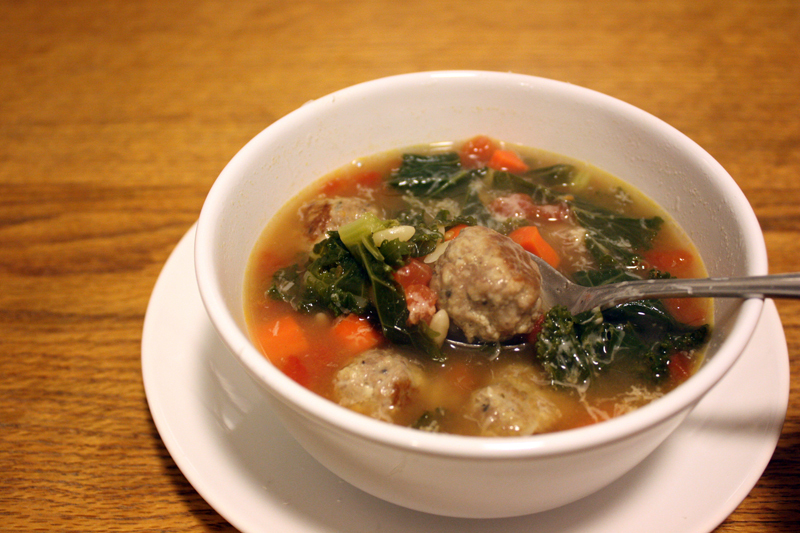 After a couple weeks of eating take-out and way too many Christmas cookies, this soup really hit the spot. The meatballs are full of flavor, with a little kick from the red pepper flakes. All the herbs I used were dried but you could definitely substitute fresh herbs if you have them. Just double the amount. Parsley would also be good here, but I didn’t have any on hand. I like to brown the meatballs before adding them to the soup, but you can certainly just drop them right into the simmering broth to cook. In a small bowl, lightly beat the egg. Add milk, breadcrumbs, basil, oregano, red pepper flakes, rosemary, salt, pepper, cheese, and garlic. Mix well to combine. In a large bowl place ground turkey. Add the egg mixture and mix well. Form into 1-inch meatballs. Brown the meatballs in an oiled pan, then remove from pan and set aside (to make cleanup a little easier, brown the meatballs in the same pot you'll make the soup). In a large pot or dutch oven, heat about a tablespoon of olive oil. Add carrots, salt, pepper, and thyme and saute a couple minutes, until starting to get tender. Add tomatoes, pasta, and broth and bring to a boil. Add the kale and meatballs and simmer about 10 minutes, until the pasta is tender. Serve, topped with additional parmesan cheese if desired.